Do you ever struggle to find time for Bible study and prayer? Goodness, I think that I can hear all of the amens going up around country! I get the struggle. I LIVE the struggle. I love Jesus, but I get distracted. Don't let me pick up my smartphone and accidently hit the Facebook app instead of my Bible app. But, are we missing our blessing? When I spend regular time in Bible study and prayer, I can feel it! The sweetness of God's Holy Spirit leads me and I am so blessed. In a world filled with rising chaos, the Holy Spirit supplies the love, joy, peace, patience, kindness, goodness, gentleness, faithfulness and self-control that blesses my life. (And my family likes me so.much.more. But, what happens when I don't spend time with God? People start getting on my nerves. My words lose their sweetness. ...after 3 days, he can tell the difference. ...after 5 days his family can tell the difference. ...after 10 days EVERYONE can tell the difference. Do you want God's Word to flow deeper into your heart and mind? I'm not talking about just doing a deeper Bible study, but do you want the truth of the scriptures to bury deep in your heart? 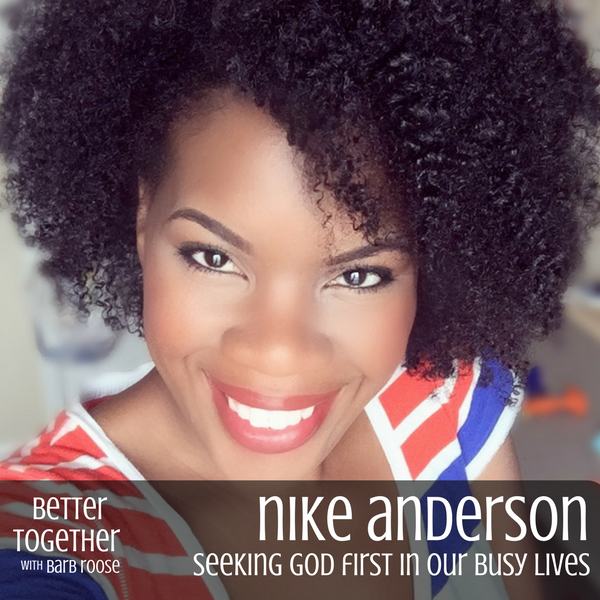 Listen to this Better Together podcast episode Nike tells us about a question that she's been asking God. She also tells us about an ah-ha moment that she had while reading 1 Corinthians 13:4-7 that taught her about embodying God's Word, instead of just reading God's Word. Are you tired of watching people fight with each other? Do you get discouraged when you see Christians unfriending each other, not just on social media, but in families and friendships? If so, then you’ll be encouraged by today’s podcast. I’m sitting down for an important conversation with Bible study teacher and author, Melissa Spoelstra for a kingdom conversation on the Bible teaches Christians to handle disagreement. She recently released a Bible study on the book of 1 Corinthians, a New Testament letter written to church leaders trying to deal with the fighting and drama in their churches. Sound familiar? Melissa is the author of the Bible study, 1 Corinthians : Living Love When We Disagree. This is such a well-timed topic for our culture today, especially for Christians. How do we love each other even though we don’t share the same perspective or convictions? We do know this: That when Christians disagree poorly, the gospel message gets lost and lost people stay lost without that message of hope. Friends, we’ve got to change this! How Paul’s counsel to the leaders of the Corinthian church provides encourage and practical advice for us to apply to our lives today. Find out more about Melissa's book and Bible studies by clicking here. Melissa Spoelstra is a popular women’s conference speaker, Bible teacher, and writer who is madly in love with Jesus and passionate about helping women of all ages to seek Christ and know Him more intimately through serious Bible study. She holds a Bachelor of Arts in Bible Theology and enjoys teaching God's Word to diverse groups and churches within the body of Christ. She is the author of the First Corinthians: Living Love When We Disagree, Joseph: The Journey to Forgiveness, Jeremiah: Daring to Hope in an Unstable World Bible studies, and Total Family Makeover: 8 Steps to Making Disciples at Home book. She lives in Dublin, Ohio, with her pastor husband and four kids. Find her on Twitter @melspoelstra and Instagram @daring2hope, and follow her blog at MelissaSpoelstra.com. 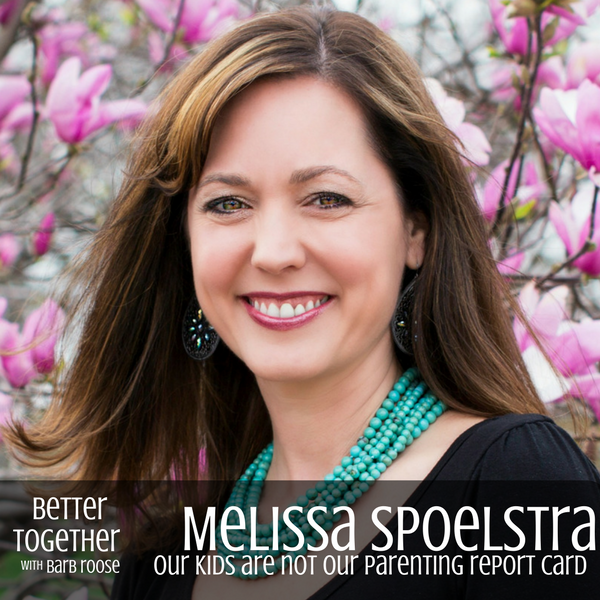 Have you ever felt like your child was your parenting report card? If he or she was doing well in school, then you felt great. But, if your precious cherub was causing the teacher to pull her hair out, then you were failing. How do we snap out of making our kids our “report card” and instead love and raise them as God calls us to do? Proverbs 22:6 tells us to direct our children onto the right path so that when they are old, they will not leave it. If the Bible tells us to teach our kids God’s ways, how do we teach when we’re not always sure on how God wants us to live? Today’s guest, Melissa Spoelstra coaches moms through eight areas that we need to teach our children so that they can develop their own relationship with God. As the mother of four kids, aged 20, 16-year old twins and 14, Melissa understands the difficulties and hard decisions that go along with parenting. According to Melissa, parenting is never about perfect, but intentionally planning out how to disciple our children so that they can learn to love Jesus. In her book, Total Family Makeover, Melissa discusses how Jesus modeled certain disciplines, like prayer, mentoring and service. Then, Jesus taught the disciples how to integrate those same disciplines into their lives. Melissa will share her experiences as a mom, stories about how she’s “failed forward” as a parent and encouragement for any mom who’s at the end of her rope.